This is big. This is game changing. Huggies now has the world’s first squirm-proof diaper. So let’s send a message loud and clear, directed right to squirmy baby Moms… We get the whole “Battle of the Squirm.” And now – finally – there’s a solution. New Huggies Slip-On Diapers make the whole act of changing easier. Now Mom and baby can literally slip into a more comfortable changing time routine. Simply catch squirmy baby, slip-on, and release. That’s it! Baby is free to go about his business of squirming around the house. And he and Mom both have a smile on their face. Because Slip-Ons fit snug and secure every time. No criss-crossed tabs. No exposed cheeks. No loose, swinging and falling off the waist. And taking them off is super easy with the easy open sides. 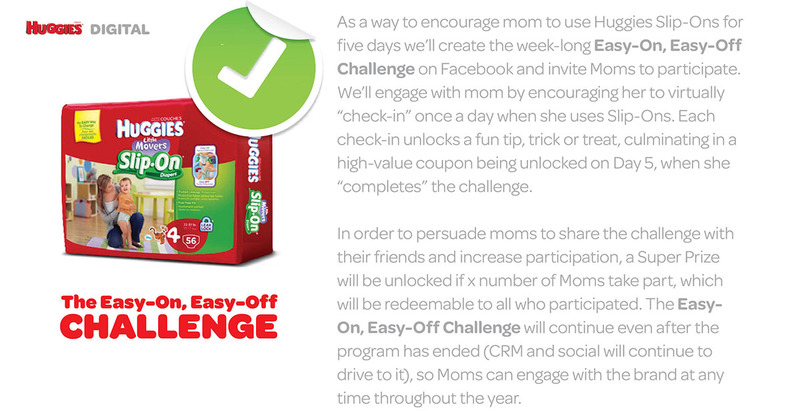 The world of diaper changing just got what every parent’s been hoping for – a heck of a lot easier. With new Huggies Slip-On diapers, all Mom and baby have to do is slip right into it. ProTexting’s technology easily integrated into the overall solution. It provided the immediacy needed for delivery and exchange of information. The Ogilvy team was able to track SMS traffic in real time and optimize the technology as needed. Ogilvy is the North America agency of record for the Huggies brand.